UBC Library’s Great Reads Collection is highlighted in the Ubyssey, UBC’s student newspaper. 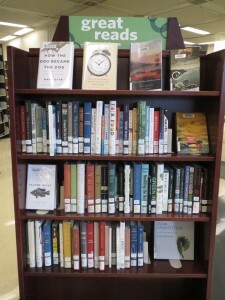 Read “New library collection highlights good reads, the old-fashioned way“ in the Ubyssey. 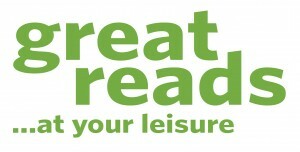 UBC Library’s Great Reads program has expanded to include Woodward Library. The leisure-reading program, initially launched at Koerner Library last fall, also has a location at the Irving K. Barber Learning Centre. The leisure reads include bestsellers, Canadian fiction, and “popular” reading material typically found in a public library. The Woodward location features materials related to the life sciences, with topics such as such as cholera epidemics, Charles Darwin, or new fiction such as Salmon Fishing in the Yemen. Readers interested in fiction, bestsellers and humanities and social sciences reading can visit Koerner Library for more book selection. Materials related to art, architecture, science and engineering are located in the Irving K. Barber Learning Centre. For a virtual bookshelf, Google book reviews, or to suggest new material, visit the Great Reads website. It’s almost the end of the academic year and we’re putting the finishing touches on the renovations to Koerner Library’s 3rd floor – just in time for final exams and end-of-term papers. 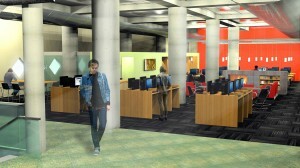 The revamped study space and reading area will re-open on Monday, April 2 and feature new computer stations and open group study areas. The space will also be the home of Koerner Library’s Great Reads leisure reading collection, located next to casual seating and a cozy fireplace. Students should take note that take-down of the temporary wall will begin on Friday, Mar. 30 so there may be some noise and debris on the 3rd floor during that time. However, students will still be able to access the look-up computers on this day and into the weekend. The space is scheduled to open on the morning of Monday, April 2. Should there be any changes to the scheduled opening date, we’ll post the information on the Library’s Facebook and Twitter accounts.